Just hours after the Alberta government announced that ducks had landed on a Syncrude tailings pond, officials said similar incidents had occurred at ponds belonging to Shell and Suncor. Workers can be seen standing beside ducks lined up next to the Mildred Lake settling basin in northern Alberta on Tuesday. ((Courtesy Edmonton Journal))Just hours after the Alberta government announced that ducks had landed on a Syncrude tailings pond, officials said similar incidents had occurred at ponds belonging to Shell and Suncor. Earlier Tuesday, the province announced that ducks had been discovered on a tailings pond at Syncrude's Mildred Lake facility on Monday night. About 230 birds that made contact with the pond's toxic brew of bitumen-extraction byproducts had to be euthanized, according to Syncrude. Suncor stated that "a small number of oiled birds" were euthanized on the advice of Alberta fish and wildlife officials, but it did not specify how many had been killed. 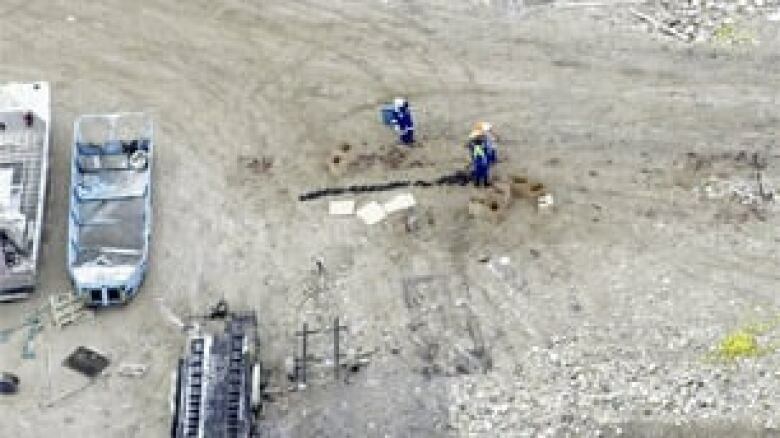 Shell issued a statement saying two birds had been found dead and two other oiled birds had been seen at its Muskeg River tailings pond but could not be captured. "We are co-operating fully with regulators and are working to minimize waterfowl losses," Scott Sullivan, Syncrude president and CEO, said in a written statement. "This is very unfortunate, especially given the significant efforts we have taken to improve our deterrent system." Companies are citing freezing rain in the area as a factor in the incidents. Syncrude said the "unusual bird activity" was due to freezing rain in the area, which made it difficult for the birds to fly. The birds that landed on roads and parking lots were easily approached, likely meaning they were fatigued. Alberta Environment Minister Rob Renner speaks to reporters about the new case of ducks landing on a Syncrude tailings pond. 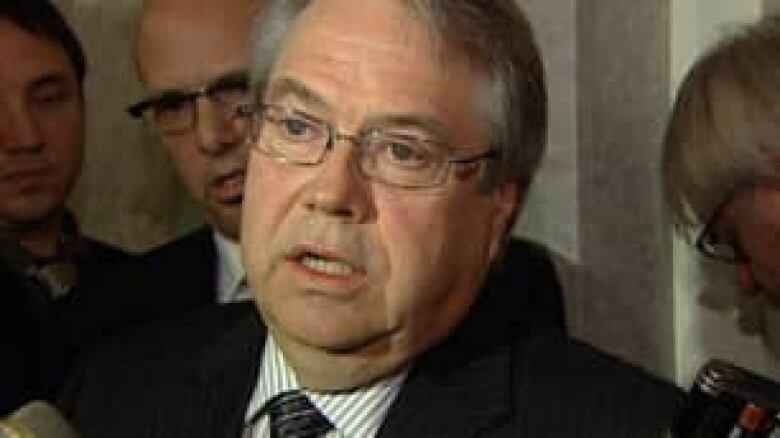 ((CBC))The Mildred Lake incident came days after Syncrude agreed to pay a $3-million penalty for the deaths of 1,600 ducks in another tailings pond in April 2008, in a deal its lawyers reached with the provincial and federal Crown prosecutors. "I cannot express how disappointed and frustrated I am that this incident occurred," said Environment Minister Rob Renner. "Albertans deserve answers to why this happened again, and we will do everything we can to get those answers quickly." Provincial officials were on site investigating and ensuring Syncrude was preventing further birds from landing. Renner said air cannons that are supposed to scare migratory birds away from the tailings pond were operating Monday. But he confirmed there was freezing rain, which sometimes results in birds landing anyway. Syncrude spokeswoman Cheryl Robb said staff discovered the birds around 10:15 p.m. Monday. Premier Ed Stelmach listens to a reporter's question about the discovery of ducks on a Syncrude tailings pond. ((CBC))"Our deterrence system was in full operation at the time but our staff got extra air cannons, flare guns and air horns to try and scare the birds away but with no luck," she said. Alberta Premier Ed Stelmach called the situation "aggravating and frustrating," especially coming so soon after Syncrude was fined $3 million on Friday for the 2008 deaths. Stelmach said he wants to know why and how this incident happened, and whether the deterrents were in place. 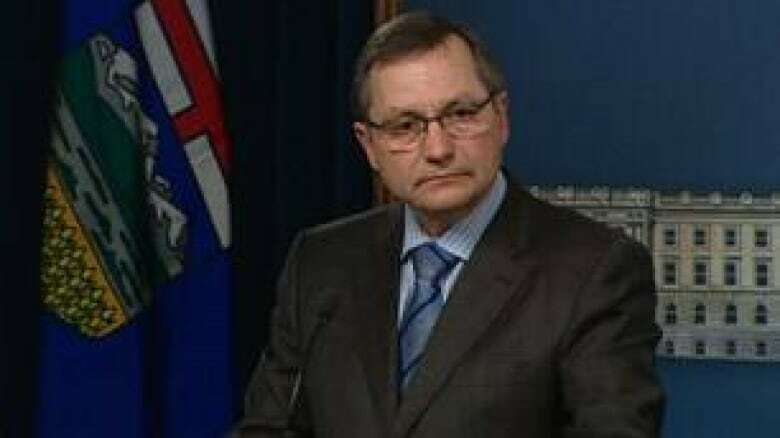 During a news conference, Stelmach was asked what effect Monday's incident would have on Alberta's attempts to improve the image of the oilsands. "It doesn't help," he said. "But on the other hand, we are always very clear that no matter what resource you develop, there are some environmental risks, and this is one of them." "I'm more than disappointed. I'm angry," Alberta NDP MLA Rachel Notley said. "For the last two years, since the last time this happened, the government has done nothing but invest money in PR. "What needs to happen is the government needs to finally take this seriously. They need to take action, they need to enforce their own standards, they need to increase penalties, so they actually serve as a deterrent. That's not happening right now." Notley said the latest incident creates an impression that the province isn't taking its obligation to develop and clean up the oilsands seriously enough. According to Greenpeace, the industry should stop using tailings ponds. "The fact is that these toxic tailings lakes pose an ongoing threat, not just to bird populations but to animals and to downstream communities as well," said Greenpeace Alberta campaigner Mike Hudema. In its operating approval, Alberta requires Syncrude to ensure birds do not land on the tailings ponds. After the 2008 duck deaths, Syncrude invested millions in bird deterrent systems and started running them year-round, Robb said. "This has hit us really hard and we are continually learning as a company," she said. " We will want to understand what's happened in this situation."